Hideo Kojima, the legendary creator of Metal Gear Solid, will receive his Industry Icon trophy at The Game Awards 2016 one year after he should have. That’s right. If you recall, Konami prohibited him from attending last year’s event; at that time, Hideo Kojima was still under Konami’s employment but we already guessed the relationship was about to end. For the record, Metal Gear Solid V: The Phantom Pain won the award for Best Action/Adventure Game at The Game Awards 2015. Host Geoff Keighley voiced all his disapproval at the time. Mr. Kojima had every intention of being with us tonight, but unfortunately he was informed by a lawyer representing Konami just recently that he would not be allowed to travel to tonight’s award ceremony to accept any awards. He’s still under an employment contract and it’s disappointing. 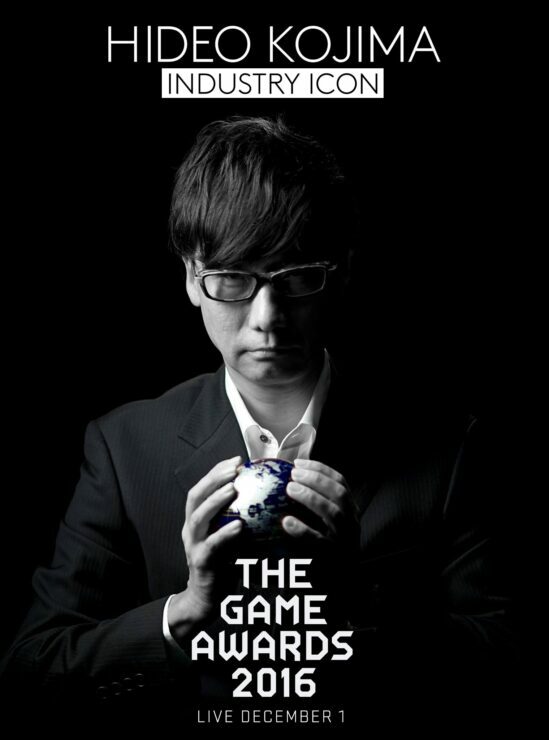 Now that Kojima has gone independent, though, there’s no one left preventing him from accepting the Industry Icon prize and Geoff Keighley was proud to reveal that this will happen at this year’s The Game Awards 2016, scheduled for December 1st. Hideo Kojima is one of our industry’s most accomplished and innovative storytellers. When we started work on this year’s Game Awards, my first priority was to make sure we honor him properly in front of his peers and fans. Past recipients of the Industry Icon Award include Bretty Sperry and Louis Castle (who founded Westwood Studios, responsible for games like Command & Conquer, Dune II and Nox) and Ken and Roberta Williams (who founded Sierra Entertainment, responsible for games like King’s Quest and Leisure Suit Larry). Hideo Kojima is now working on Death Stranding at Kojima Productions. The open world action game received significant funding from Sony and should launch first on PlayStation 4, though the game designer mentioned some time ago that a PC version would release afterward. It is expected to be available in 2018 or 2019. Meanwhile, Konami is having trouble with the reception surrounding the new zombie-themed Metal Gear Survive game and Hideo Kojima didn’t lose any time making his disapproval known.